In India, there's no season called Spring and we directly have to embrace summer after the chilly winter. Of course, there's no reason to hate it, as we have a reason to flaunt some of the most stylish attires from our wardrobe. Be it those uber cool bikinis or mini floral dresses or just picking the right shade of 'yellow', summer is the time to sizzle in different outfits and our Bollywood divas show you the right way. With the onset of this new season, bid adieu to all the dark colours and start picking the lighter shades in everything. Welcome those lilacs, mint green, sea blue and sunflower yellow instead. Alia Bhatt's Shimmery Green Skirt With Fringe By The Hem Gets Full Points On Our Style Meter! Okay, so you think sunflower yellow is pretty harsh on your eyes? Well, it won't be if you style it the right way. 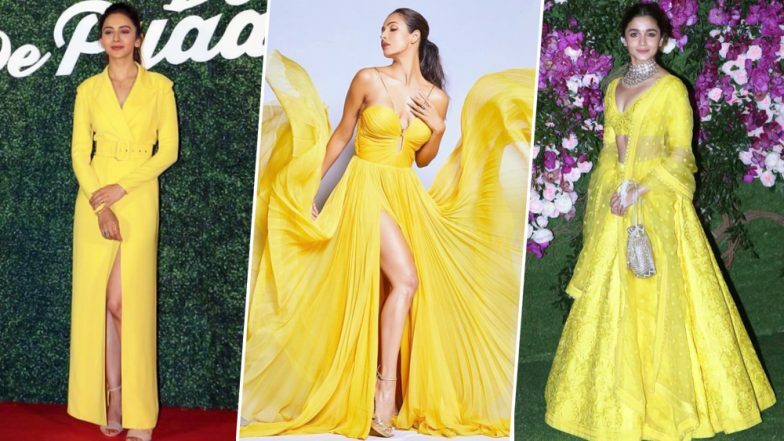 Take some essential cues from Malaika Arora, Katrina Kaif and Alia Bhatt this season on how to nail that yellow outfit right. It could be an elegant lehenga or a chic gown, but there's always a right way to wear it. Go ahead and have a look at some of our B-town stunners who aced this colour game with some overwhelming results. Malaika Arora and Tamannaah Turn Muses for Bobbi Brown at India Makeup Show 2019. There you go. Yellow is one of the easiest colours to carry and the trick behind it is to let go of your jewellery. While you can always style yourself with ethnic jewellery paired with an elegant lehenga like in Alia's case; but avoid using it other times. Let your bright attire do all the talking instead.